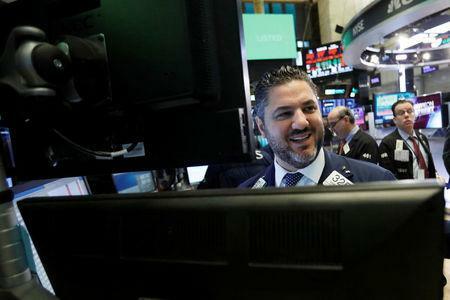 U.S. stocks were broadly lower, with energy shares <.SPNY> falling more than 1.0 percent as benchmark Brent crude oil saw a six-month low and U.S. crude fell below $60 for the first time since March. "Oil is spooking the market. If oil prices are going to go lower that's another sign that the global economy is going to slow its growth," said Chris Zaccarelli, chief investment officer at Independent Advisor Alliance in Charlotte, North Carolina. "It looks like a slow (stocks) sell off. All day long its been drifting lower." The Dow Jones Industrial Average <.DJI> fell 201.92 points, or 0.77 percent, to 25,989.3, the S&P 500 <.SPX> lost 25.82 points, or 0.92 percent, to 2,781.01 and the Nasdaq Composite <.IXIC> dropped 123.98 points, or 1.65 percent, to 7,406.90. The Federal Reserve decision disappointed some investors who had hoped that the sharp share price falls during what has been called "Red October" might have encouraged the U.S. central bank to take a more dovish approach toward monetary policy. The pan-European STOXX 600 index <.STOXX> lost 0.37 percent and MSCI's gauge of stocks across the globe <.MIWD00000PUS> shed 1.08 percent. The U.s. dollar, which had weakened sharply after Tuesday's U.S. mid-term elections, was up for a second straight day and on track for a fourth straight week of gains. The dollar index <.DXY> rose 0.19 percent, with the euro down 0.26 percent to $1.1333. The equity weakness pushed bond yields lower. Benchmark 10-year notes last rose 12/32 in price to yield 3.1875 percent, from 3.232 percent late on Thursday. U.S. West Texas Intermediate crude settled down 0.79 percent at $60.19 per barrel and Brent settled at $70.18, down 0.67 percent on the day.